Almost the first thing we did when we got our future homestead property was to put up a fence for the garden and orchard, before we had even moved there. 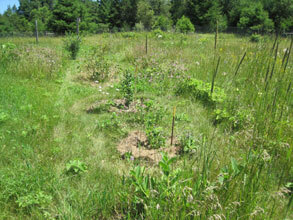 The next summer we tilled up an area for the garden and planted some fruit trees in the farmed out sandy-loam soil. 1978, almost forty years ago, and we are still putting up fence and planting trees! But now we are enjoying the fruit as well as the labor. It's been, and continues to be, a great adventure, a great amount of learning, and a whole lot of fun. My notes are a little sketchy from those first years; we were busy with working out, building the cabin and house, creating our homestead. We planted those first trees with love but little knowledge. Thankfully some of the trees had strong inclinations to not only survive but grow and produce, and they did, eventually, more in spite of us than because of. The only record I have of that first momentous occasion of the "First Fruit" was a note in my canning notebook, 1987, "70 apples, mostly spys but some macs, good." I assume we were more excited and appreciative than that sounds! Only a few of those original trees, apples, are still with us (the "spys" that we were told were Prairie Spys but turned out not to be) but they have been joined by many more now, with new arrivals every year. The orchard has become my great passion, with Steve's support, help and encouragement. The additions were sporadic and occasional through the years until six years ago when we discovered grafting, and had more time to spend in the orchard. In the summer of 2016 we had 21 apples, 2 pears, 3 cherry, 9 plums/chums, many rootstocks waiting for grafts, plus a nice contingent of small fruits, happily surrounding the vegetable garden. And more are being added every year. Many of the trees are not bearing yet but the anticipation is there. So it was time for the orchard to have a well deserved spot on the website. 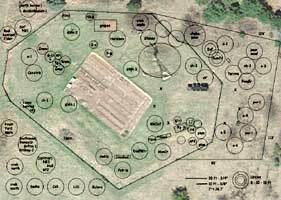 It might be called a food forest, or permaculture design, or eco orchard, or some other current label. 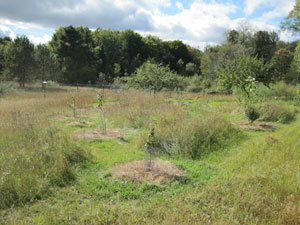 But for us it is just our ever growing, ever expanding homestead orchard which includes so much more than fruit trees. It grew organically and naturally over the years (decades!) and is grown organically and naturally. We like it a lot. It's a bit daunting to think of how to share so much experience with our readers, in some reasonable order, in some useful fashion. The rest of our website was built piece by piece over the last twenty years, not all at once. 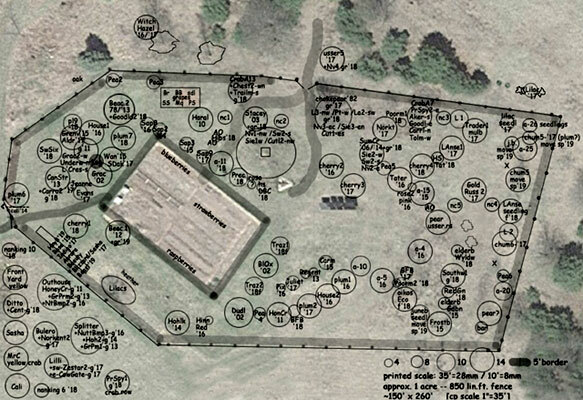 So I think that is how I will begin sharing our orchard, piece by piece, as it occurs to me. Some will be new articles, some will be posts from our Blog, some (the berries and small fruit) are already on the website in the Garden section (also in the menu above), some photos, some words. However it arrives I hope you will enjoy and be inspired to do whatever suits you and yours, as I have done in my orchard, with great joy in being a part of that wonderfully eclectic dynamic world. The photo above is how the orchard looked in fall of 2016; below two years later, with the much appreciated new fencing in place and many new plantings added. Not much room inside the fence now for new trees but there is grafting to be done to add new varieties, and many smaller shrubs to plant as well as herbs and flowers in-between. It continues to be a very enjoyable and creative adventure for me. My orchard certainly would be considered “organic” since I don’t use any chemical sprays or synthetic fertilizers, but I also consider it organic in its layout. Although I’m happy to have more or less straight rows in the garden, which is laid out in a rectangular form, the orchard has grown into a much more flexible, winding shape which I’m finding we both enjoy a lot. Some of it happened by chance, some by purpose, some I’m working now to fit into a flowing form that will be easier to manage. The orchard is small enough to easily walk to any part (about one acre inside the fence) (though it is already growing beyond the fence!). But my method of management is to have mown paths along either side of the fruiting/flowering corridors of trees, bushes, and plants, leaving areas of natural vegetation between. It’s been an interesting challenge fitting the haphazard parts into a practical mowing pattern, in, out, and around in a pleasing manner without going over the same ground twice. I think I’ve spent more time figuring this out than I have deciding what to plant or graft next! But it’s been a fun puzzle which will change as the trees and bushes grow, hopefully into an even more pleasing meander. It’s certainly not what one would call a landscaped area; it is definitely more casual, but with purpose. And even though many of the trees and bushes are small yet, it is a pleasure to walk along the roughly mown paths imagining what it will be like when they are full grown. I like this much better than mowing the entire orchard floor, and I think it is healthier for all. Awhile ago I read about someone who painted small stone red and put them among his ripening strawberries with the idea that birds would peck the stones, find them inedible, and go elsewhere, leaving his strawberries alone. It worked for him. So last year when a flock of bluejays made significant inroads into my apple crop, that idea came to mind and I decided to do that on a larger apple-size scale the next year. Meantime I kept an eye out for plastic fruit at the thrift stores, stocking up for the coming season. Summer came and I painted any of those of my plastic fruit, or round apple like objects, that weren’t already red and attached wire hangers. 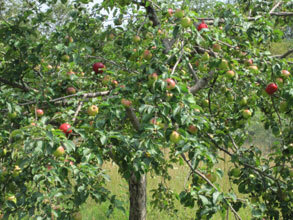 When my real apples started ripening I hung plenty of red decoys in the trees (all thse “red apples” in the photo). I really didn’t want to share my good apples with the birds. They have plenty of crab apples to eat. Did it work? Well, I only had a little incidental bird pecks in a few apples so I could say yes, it worked well. But, to be honest, I also didn’t notice any more than one bluejay around, which was unusual in itself (we do usually have more). We did have a flock of robins but they appeared to be more interested in the bumper Autumn Olive crop. But for whatever reason, I am very happy to have avoided any bird damage this year, and next year I will again hang my bright decoys in the ripening apple trees. Today I finished pruning the last apple tree on my list, a wild apple in our yard, a little more than 2 wks from when I started working on the apples and pears. The many young trees I have in the orchard need very little pruning, if at all, as they need to keep all of their early growth of branches and leaves to build a healthy root system. The real pruning starts (and continues!) when they start bearing a crop. This is when I spend almost as much time looking and studying a tree as I do clipping and sawing. We have only one apple tree, a Haralson, that has anywhere near a “standard” (according to the drawings in books) shape, and moderate growth. It doesn’t take long to prune him. All the others are quite independent minded in how they grow. They aren’t so easy. It’s a lifetime learning to prune well but I’m enjoying the challenge, especially as my skills are improving. We have four producing “tame” apples and one pear. These are all trees we planted. There are also a half dozen wild apples with varied fruit quality but I usually make use of the apples in sauce or cider. Some of the trees I’ve been working on for many years to get them to a manageable size and they are all now finally coming into shape, each in their own way. But all can now be reached standing on the top of my 8 ft ladder for pruning and harvesting. Though not as impressive as the 30 ft standard trees we used to have they are much easier to care for and give us better fruit. I’m happy with the new 11-12 foot heights, and I hope the trees are, too. As I have many dozen small trees coming on it’s particularly nice to have the older trees easier to manage, and the new ones being shaped as they grow. When I look at my map I wonder just what we’re going to do when they are all of bearing age?! Last count there were 58 trees total, most of which we have grafted or will graft soon. Not all are apples and pears, the total includes plums and cherries (which I won’t be pruning until after blossom time, when growth is strong and healing from the cuts fast) (apples and pears are not so sensitive so can be pruned before growth starts). But the higher proportion are apples, and they take the most pruning to keep them open enough for good air circulation and for healthy new growth, and healthy fruit. They don’t all produce each year, of course, but it will be great when we have enough bearing trees to have an abundance of fruit all year--fresh, stored, dried, or canned, and enough to give away. Along with our many berries we are well on our way to that pleasant state. I do enjoy spending this time with the fruit trees. 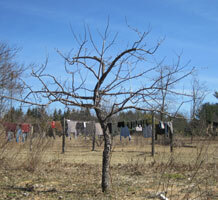 Pruning requires significant attention to each tree that it doesn’t always get at other times of the year. And it’s a great time to be outside working--post snow (well, most of it anyway) and pre mosquitoes and black flies. And the anticipation of the coming growing season and potential fruit is delicious indeed. The tools for pruning are simple -- a ladder, hand pruners, loppers, pruning saw. As with most jobs, the quality of the tools can make quite a difference in the quality and joy of the job. What I have is quite adequate, and all are nice upgrades from previous tools. And I thought my old hand pruners were just fine. But some folks on the GrowingFruit forum talked highly of their favorite pruners and I wondered if there might be a better pair out there for me. Mine were a gift years ago, much appreciated and well used, being sharpened almost to the point of needing new blades. They are on the large size but it never occured to me that there might be smaller ones out there, nor that it might make a difference. But the seed was planted, and I wondered...looked online...mmm, those sure sounded nice. But really, mine were working just fine. Then I won a nice 50/50 raffle at a polka dance...and I ordered my new 7” (small size) ARS Hand Pruners the next day. And wow! Are they ever nice! Sharp right out of the package, very comfortable in the hand, easy to use. I couldn’t wait to start pruning, and when I did I realized what a big upgrade these were. The quality of the tool is high, the cuts clean and easy, and having a hand pruner that fit my smaller hand definitely made a big difference in comfort for many hours of pruning. I really do like my new hand pruners! So does Steve. When we were asked recently to do some bench pruning for friends Steve decided to use the new pruners instead of a knife as he usually does for the cuts because they do such a nice, clean, straight cut. They made the grafting job just a little easier. (He does the knife work; I do the wrapping and follow-up). Plus, they gave us four apples fresh from their root cellar (this is in mid April!). What a treat to have a good home-grown apple this time of year. They were from an old apple tree on their farm and we brought home scions from that tree to graft onto something here. Certainly a tree (and fruit) to look forward to. It feels like we went from two months of Octobers right into January, skipping November and December this year. I think Nature just gets bored and enjoys having a little fun with us. 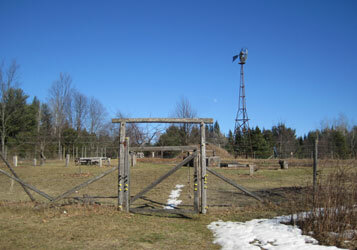 But lows of zero with highs barely into the teens means many cheery sunny days, and a happy solar homestead. The snow cover is a bit light for those low temps but it’s snowing this evening with promise of several more inches. 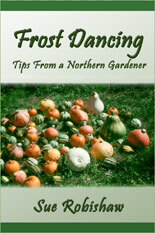 That will be good, not only for insulation on the house but for the orchard and garden. All of the younger fruit trees, berries, shrubs, plants are well mulched but I always feel more comfortable when they have that extra blanket of natural insulation to get them through the winter. And this year there are a group of seedlings that were transplanted late (because I could, thanks to the very mild November) who will especially appreciate that comfort as they go into winter in their new homes in the “new” orchard. On paper there isn’t much distinction between old and new but for that all important item -- the fence. 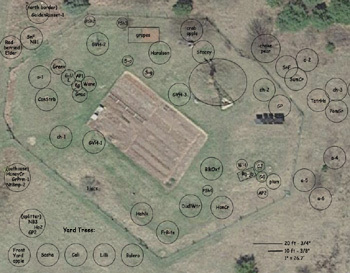 A couple of fruit trees had already settled beyond the current fenced half acre of land where about 30 fruit trees plus various shrubs, berries and large garden are nicely protected from deer and raccoons. But there just wasn’t room for all the plantings of my dreams to fit in there. We have already grafted onto a number of wild crab/apple seedlings out and about but they will require individual fences for many years to come to keep the deer from “pruning” them to stubs. Then they’ll need to be grown tall enough to keep at least some of the fruit out of their reach if I want to harvest any for us. That’s fine for a handful of trees but not for the number I’m planning. Plus I want to grow my trees shorter than “above deer reach”. It was obvious -- the fenced in orchard needs to expand. Happily, just east of our current set-up makes sense. We roughly outlined where the new fence could go, given the terrain and the existing white pines, wild black cherries and other wild growth. The fairly open area was full of dewberry brambles and rough field so we mowed it with sickle bar and hardy, overworked gas “lawn” mower, and Steve cut down a few trees. I spent many a happy hour with PhotoShop moving little circles around and imagining what might go where. Then back and forth to the “real” plot to re-organize and re-arrange based on what felt and looked right in person. I wanted groups of fruit trees with room for lower growing shrubs and plants. It was fall but thanks to the extended mild weather it didn’t take long to fill in most of the spots with transplanted crab and apple seedlings to be grafted next spring or later. Plus several already grafted seedling made their way to the new orchard to join the ten year old Summercrisp Pear that has been living outside the fence for so many years. Our old pear rootstock which is a beautiful 35 ft tree with inedible fruit (to us--the deer love them) will end up inside the new fence where it doesn’t need to be for any reason except that’s where it’ll end up if I run the new fence where I want to. Which means I’ll be picking up a lot of those little 1” choke-pears and tossing them over the fence for the deer in the future. But that will be easier than angling the fence around the tree. I think. The new fence for the new orchard expansion won't happen until next summer so I put temporary individual fences around all the newly transplanted seedlings. Yep, already we’re looking at another new area. See, I've been reading the experiences of a number of creative folks who don’t pay much attention to what others say they can’t do, they just go ahead and dream, building on what other pioneers have done, add their own ideas, and push the limits to grow apricots and peaches and sweet cherries and less hardy apples and pears and who knows what else in those cold chilly zones where people never store away their long-johns and wool mittens and knitted toques. The mind is a fascinating creature. Maybe it doesn’t make sense to try to grow sweet cherries here, but that doesn’t stop my mind from heading off immediately into ideas of how I MIGHT grow sweet cherries here. Which means more room, which means an addition expansion to the expansion that hasn't even made it beyond paper. This is fine because it's easier to move things around on paper than to dig up and reset fence posts and fencing. 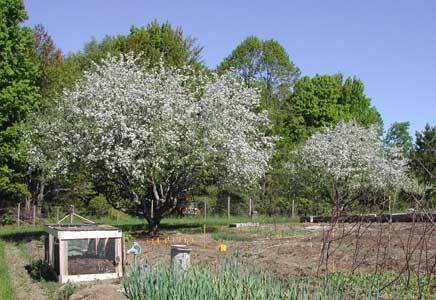 Meantime, I’ve been promised scions from a wonderfully very old pear tree growing in L’Anse up near Lake Superior and have room for two pears in the expanded orchard area. Now, to decide what to graft them to... Someone has promised me 5 Harbin/Siberian/Ussuriensis Pear rootstocks in the spring. Then I read about trials in Canada with grafting to common hedge plant cotoneaster lucidus. Mmmmm. BTW, it’s not pronounced “cotton easter” as I have been doing (in case you are wondering, which likely you aren’t, but...) it is properly, apparently, pronounced “ko-tony-aster”. It’s not common to me (being woods oriented not town landscape oriented) but I may try to find a few seedlings come spring. This type of thing keeps me well occupied and the computer humming these cold, dark, cozy winter evenings. And I haven’t even started researching what plums I want to graft next spring. Plus I need to pare my list of 22 apple varieties down to 6. Now that’s some hard work, especially since I keep adding instead of subtracting. Some have sugar plums dancing in their heads this time of year, I have apples and pears and cherries... Such is the lot of a semi-practical homesteader.